Ardiyooloon is home to the Bardi-Jaawi people and sits at the end of a red dirt road at the top of the Dampier Peninsula, 200km north of Broome in the north-west of Western Australia. 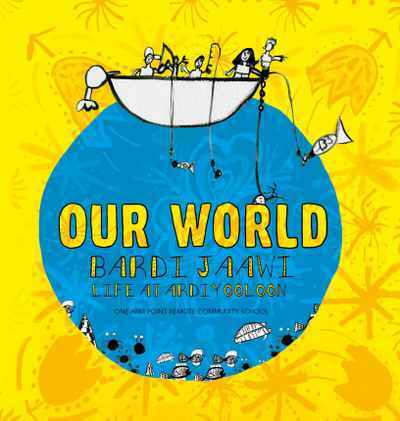 Our World: Bardi-Jaawi life at Ardiyooloon takes readers inside the lives of the children of a remote Indigenous community — lives very different to those experienced by most Australians. The children take readers camping and fishing, share traditional stories and dances, show them how to find a waterhole, track, cook and eat bush tucker and animals such as turtles, crabs, oysters and clams, and make spears, boomerangs, bough shelters and bush brooms. Created by the children themselves, it is full of colourful illustrations and amazing photographs of the students experiencing their world and keeping alive the age-old traditions of their people.